With the recent coalition air strikes against Libya, something struck me as peculiar - various legislators were coming out criticizing the decision of the administration for acting without giving what they believed to be deserved consideration to the legal and legislative branches of the government. As the United States expands its military imprint on the international intervention into Libyan airspace, members of Congress have begun sounding the alarm over the lack of regard being paid by the president to the legal and advisory roles of the legislative branch. On Sunday, House Speaker John Boehner (R-Ohio) offered his endorsement for a no fly zone over Libya. Conspicuous in his statement, however, was the threat to disrupt future operations should the president not consult Congress first. A top GOP leadership aide clarified that Boehner wasn’t insisting that Obama needed congressional authorization for the use of military force in Libya. “The focus,” said the aide, “is on Congressional consultation.” At an off-camera briefing hours later, National Security Adviser Tom Donilon called such a request “fair" while arguing that it had been met by the president. But Boehner's remarks still underscore the domestic political limits Obama faces as he executes, what aides insist will be, a limited, internationally-led military intervention in Libya; which, this weekend, included cruise missile attacks and air strikes. While the majority of lawmakers who have spoken publicly say they support America’s involvement in the U.N.-backed mission (some Republicans wishing it had come sooner), several influential voices have argued -- as Rep. Buck McKeon (R-Calif.), Chair of the House Armed Services Committee did -- that the President “has an obligation to explain” operational objectives to Congress. Lower on the leadership ranks, a strange-bedfellows coalition of progressive-minded pols and Tea Party members has emerged, not only raising doubts about the underlying strategy but the legality of it as well. I found this criticism to be nothing more then partisan whining because after all, Republicans are the ones who are supposed to be tough and Democrats are supposed to be a bunch of spineless peaceniks. 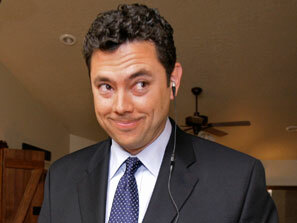 Rep. Jason Chaffetz is a perfect example of the hypocrisy of Obama's critics. Chaffetz believes there is no immediate threat to America and that the president needs to explain himself, but how exactly would Chaffetz explain his signing of a letter to President Obama blasting the administration for planning to send $400,000 to Libyan foundations - Libya was on the U.S. list of state sponsors of terror and it is believed that charitable donations - especially ones foundations headed by the children of Libyan dictator Mom are just funneled to terrorist organizations, which is why Chaffetz was upset in the first place. Chaffetz, by the way, is against terrorism and for defending America. Certainty about how to deal with our enemies serves to reinforce our standing in the world. The two years of indecision supports the conclusion that our adversaries — and many of our allies — have reached: The United States no longer projects a determined course for freedom and the rule of law. Wouldn't the participation in the air strikes against Libyan forces demonstrate American commitment to freedom and the rule of law, as well as expressing a certainty regarding how America deals with it's enemies?